This class can be used when one does not have the IDEEP implementation ready yet for an operator. Essentially, what this op does is to automatically deal with data copy for you. Plausibly, this causes a lot of overhead and is not optimal, so you should use this operator mostly for quick prototyping purpose. All the input and output of the original operator should be TensorCPU. 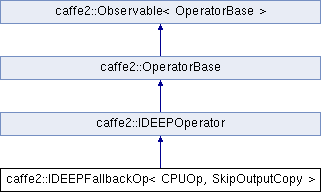 Definition at line 39 of file operator_fallback_ideep.h.